Chinese hamster ovary (CHO) cells are among the most widely used hosts for therapeutic protein production. Yet few genomic resources are available to aid in engineering high-producing cell lines. High-throughput Illumina sequencing was used to generate a 1x genomic coverage of an engineered CHO cell line expressing secreted alkaline phosphatase (SEAP). Reference-guided alignment and assembly produced 3.57 million contigs and CHO-specific sequence information for ~ 18,000 mouse and ~ 19,000 rat orthologous genes. The majority of these genes are involved in metabolic processes, cellular signaling, and transport and represent attractive targets for cell line engineering. This demonstrates the applicability of next-generation sequencing technology and comparative genomic analysis in the development of CHO genomic resources. With over half of all recombinant therapeutic proteins produced in mammalian cell lines, Chinese hamster ovary (CHO) cells remain the predominant production system for glycosylated biopharmaceuticals . Although improvements in cell engineering, cell line selection, and culture conditions have increased productivity levels , the genetic basis underlying hyperproductivity remains poorly defined. The further development of genomic resources will facilitate detailed studies of genome structure, gene regulation, and gene expression in high-producing cell lines and aid in the use of sequence-specific molecular tools in cell line development. A number of resources are required to support the assembly and annotation of the CHO genome including physical maps, genomic sequences, expressed sequence tag (EST) sequences, and proteomic data. Recent efforts to sequence and characterize bacterial artificial chromosome (BAC) libraries derived from CHO cells provide information for physical mapping of the CHO genome [3, 4]. Transcriptomic and proteomic studies are currently used to examine differential expression of high-producing cell lines and to identify gene candidates for host cell engineering [5–7]. Transcriptomic studies which rely on cross-hybridization to mouse DNA microarrays showed some success [8, 9], but also demonstrated the need for CHO-specific sequence information. Continued EST sequencing of CHO cells lines has generated databases containing more than 60,000 sequences and allowed for the development of CHO-specific DNA microarrays [10, 11]. Furthermore, mapping of CHO EST sequences to a mouse genomic scaffold can potentially reveal structural and regulatory features of the CHO genome . Such studies are limited in that only a subset of genes expressed at sufficiently high levels are captured for sequence analysis, providing little information regarding genome structure or non-transcribed portions of the genome. At present, there is little genomic sequence data available for CHO cells. This limits the application of high-throughput molecular tools in gene discovery and cell line engineering. CHO cell lines also undergo multiple genomic rearrangements during the generation of high-producing cell lines, necessitating the sequencing of individual cell lines rather than the Chinese hamster [13, 14]. Until recently, EST sequences were obtained by traditional Sanger technology , but current efforts are employing next-generation sequencing technologies including 454 and Illumina [11, 16, 17]. 454 pyrosequencing can generate up to 1 Gb of data in a single run, producing average read lengths of 330 bp with an average error rate of 4%, although a major limitation of this technology is the resolution of homopolymer regions [18, 19]. Illumina sequencing can produce up to 90 Gb of data in a single run, generating reads up to 100 bp in length with an average error rate of 1-1.5% [19, 20]. These technologies have significantly improved sequencing throughput and decreased cost, making mammalian genome sequencing feasible . In this work, Illumina sequencing technology was used to generate an initial genomic sequence library of a Chinese hamster cell line with the goal of making these data available to the community. Comparative genomic analysis of this library was used to identify and functionally classify assembled sequences that were aligned to mouse and rat genes. An initial ~ 1x coverage of the CHO cell genome provided CHO-specific sequence information for a large number of protein coding genes, including those from functional classes typically underrepresented in EST libraries. This demonstrates that even low coverage genomic sequencing studies of CHO cell lines can increase the amount of sequence information available for this cell line. Gene-amplified CHO-SEAP cells expressing human secreted alkaline phosphatase (SEAP) were previously generated from CHO-DUK cells as a model for heterologous protein production . Initial sequencing of the CHO-SEAP genome using Illumina technology yielded 2.72 Gb of genomic sequence, which represents a ~ 1x coverage of the CHO genome, estimated to be 2.8 Gb in size . Reference-guided alignment was utilized in this study because a 1x genomic coverage is insufficient for de novo genome assembly. Previous work suggests that mouse and rat show a high degree of DNA sequence homology with the Chinese hamster  and several transcriptomic studies have employed a comparative approach to examine and annotate CHO sequence data [12, 16]. Therefore, these species were chosen for comparative analysis. Reads were mapped to the reference genomes using MAQ software, which stands for Mapping and Assembling with Qualities . Nearly 9% of the total reads were aligned to both reference genomes, although a slightly higher number of reads were aligned to the mouse genome (Table 1). 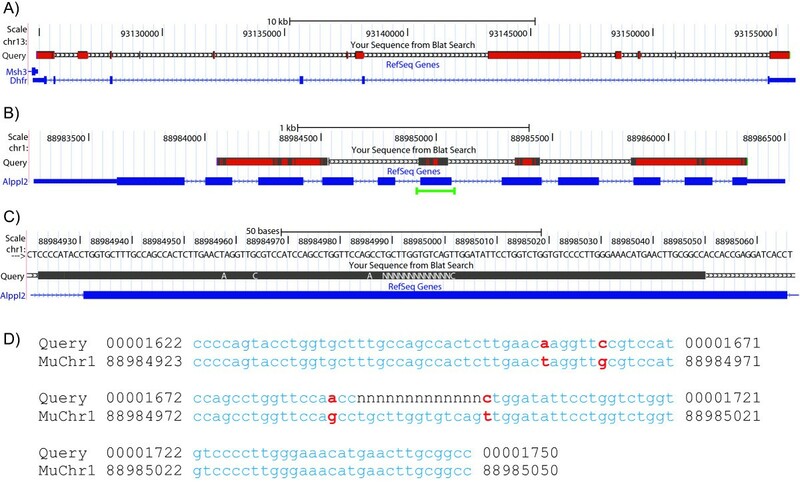 Each aligned read was assigned a mapping quality that indicates whether the read has a unique alignment or can be aligned to multiple positions in the genome . Based on MAQ mapping qualities, 50% of the short reads from the raw data set were aligned to repetitive regions of the reference genomes (Table 1). In general, results from alignment to both mouse and rat reference genomes suggest that CHO genomic sequences are generally more similar to mouse genomic sequences, as previously demonstrated . The distribution of CHO-SEAP reads aligned to the mouse and rat reference genomes was examined. The raw number of reads aligned was summed over 5 Mb bins along reference chromosomes (Figure 1). Reads were mapped along all reference chromosomes, although several regions of higher coverage are present in both reference genomes. Many chromosomes in the current build of the mouse genome contain gaps in the 5' end of the reference sequence, which may account for the low number of reads mapping to the chromosome ends. Distribution of CHO short reads along the mouse and rat reference genomes. Simulation studies based on Sanger technology suggest that most of the genomic coding sequence can be surveyed with less than 2-fold coverage  and low-coverage sequencing studies using Sanger  and next-generation [25, 26] sequencing technologies are successful in producing partial sequences of orthologous genes. Nearly 40% of the aligned CHO reads are mapped to protein-coding mouse and rat genes (Table 1). Sequence information was collected for 97% of known protein-coding genes in the mouse genome and 93% of known protein-coding genes in the rat genome. To further examine gene coverage by this data set, the number of reads aligned to each gene in the mouse and rat protein-coding gene sets was examined (Figure 2). The raw read count was normalized by gene size to generate a normalized read count for each gene. This allows for a better comparison between the number of reads aligned to both very small, from thousands of bases, and very large, to millions of bases, genes. Only 3% of mouse genes and 7% of rat genes showed no coverage. Most genes showed low to medium coverage by the CHO short reads, with 33% of mouse and 48% of rat genes showing low coverage and 60% of mouse and 40% of rat genes showing medium coverage. A small proportion of both mouse and rat genes, less than 5%, showed a high level of coverage. Because CHO-SEAP cells are engineered to express high levels of a vector containing SEAP and dihydrofolate reductase (DHFR), the coverage of orthologous placental alkaline phosphatase and dihydrofolate reductase genes was examined. The placental-like alkaline phosphatase gene, Alppl2, showed medium to high coverage with 382 normalized read counts in rat and 582 in mouse. The DHFR gene showed low coverage, with normalized read counts of 67 in mouse and 55 in rat. Genes with the highest coverage had 5,000 - 30,000 normalized read counts. Coverage of genes by short reads. Normalized read counts of CHO sequences aligned to known protein-coding genes in the mouse and rat reference genomes. The raw number of short reads aligned to each gene is normalized by gene size. Gene coverage is classified as low, with fewer than 100 normalized read counts, medium, between 100-500 normalized read counts, or high, with greater than 500 normalized read counts. To retrieve CHO sequences from this dataset, MAQ was used to assemble consensus genomic sequences of the mouse and rat alignments using sequence overlap information. In addition, performing the genomic assembly increased the length of the CHO sequences. Because of the 1-fold coverage of the 2.5 Gb mouse genome  and 2.75 Gb rat genome , a large proportion of the assembled sequences consisted of unsequenced bases, represented as N's in the consensus sequence. These files were parsed to extract CHO sequence contigs that range in size from 36 to 1,900 bp and have an average length of 54 bp, representing a 50% increase in length over the 36 bp short reads. A total of 1.86 million contigs from alignment to the mouse genome and 1.71 million contigs from alignment to the rat genome were produced. The total combined length of CHO contigs from alignment to the mouse genome was 101.6 million bases and from alignment to the rat genome was 91.4 million bases. This corresponds to a 32-36% coverage of the 2.8 Gb CHO genome. While 91% of these contigs are still short sequences less than 100 bp in length, over 9% exceed 100 bp in length and a small fraction are larger than 500 bp (Table 2). The GC content of these contigs was analyzed. Rodent genomes show a higher average genomic GC content, 42% for mouse and slightly higher for rat, compared to an average genomic GC content of 41% for human [27, 28]. Overall, CHO contigs generated from alignment to the mouse and rat genomes show an average GC content of 43.0% and 42.9%, respectively. The GC content increases as contig length increases (Table 2). This assembly set was annotated by comparing CHO contigs against custom genomic databases using a basic local alignment search tool (BLAST) algorithm . Approximately 30% of these contigs resulted in significant matches in the genomic databases (Table 3). The high average similarity of these hits, ~ 96%, was expected due to the stringent alignment criteria, including the low number of allowed mismatches. Contigs that resulted in BLAST hits ranged in size from 36 to 1,000 bp, with an average size of 60 bp. A total of 563,163 contigs resulted in BLAST hits to non-protein coding regions of the genome, providing sequence information that is unavailable from EST sequencing experiments. An additional 479,270 contigs hit known protein-coding mouse and rat genes, providing CHO-specific sequence information for 17,883 mouse and 19,481 rat genes. CHO contigs were examined in the context of the reference genomic structures. Regions within the consensus sequences were aligned to genes of interest in the mouse genome using BLAT  at the UCSC genome browser . CHO contigs aligned to DHFR, the amplification marker, and placental alkaline phosphatase, the recombinant protein produced in this cell line, were chosen because of the interest in these genes for cell line development efforts. Contigs mapped within the coding regions of the mouse DHFR and Alppl2 genes are shown (Figure 3A-B). Two contigs of average size, 49 and 67 bp in length, separated by a small stretch of unsequenced bases mapped to an exon in Alppl2 (Figure 3C) and closer examination of this alignment reveals several nucleotide differences in the CHO contigs relative to the mouse reference sequence (Figure 3D). Genomic landscape of CHO contigs. CHO consensus sequences for A) DHFR and B) Alppl2 genes aligned to mouse reference chromosomes. Grey bars represent nucleotides identical to the reference sequence and red bars represent both nucleotides that differ from the reference sequence and gaps in the consensus sequences. CHO contigs aligned to an Alppl2 exon (highlighted in green in B) shown at the C) chromosome and D) nucleotide level. Red nucleotides indicate differences between the CHO consensus and reference sequences. Consensus sequences aligned to the mouse reference genome using BLAT  at the UCSC Genome Browser . Gene ontology (GO) analysis was used to examine the functional classes of genes for which CHO sequences had been generated. GO terms were retrieved for the 17,883 mouse and 19,481 rat genes identified in the BLAST analysis of CHO contigs. A similar distribution of functional gene classes was observed for both mouse and rat assembly data sets (Figure 4). The top three functional groups identified in this analysis are genes associated with metabolism (~ 36%), intracellular and extracellular signaling (~30%) and transport (~ 17%). Although genes related to metabolic processes and vesicle-mediated transport are highly represented in EST sequencing libraries, genes involved in cellular signaling pathways are poorly represented . Therefore, genomic sequencing of CHO cell lines provides additional sequence information on members of this and other functional classes that may be underrepresented in current EST libraries. Functional classification of genes identified in BLAST analysis. A comparative genomics approach was used to generate sequence-specific information for a high-producing CHO cell line with the goal of making this data publicly available. The development of CHO genomic resources will benefit not only cell line engineering efforts to enhance biopharmaceutical production but other areas of research utilizing CHO cells, such as the use of radiation hybrid mapping for comparative genomic analysis . The analysis presented here demonstrates the potential of applying Illumina sequencing in the development of CHO genomic resources. Integration of genomic sequences derived from multiple next-generation technologies, such as 454 and Illumina sequencing, with those derived from Sanger sequencing enhance genomic coverage . The inclusion of long paired-end or mate-paired libraries, with varied insert sizes, coupled with the high-throughput of next-generation sequencing technologies should also provide not only sequence but structural information required for de novo assembly of the CHO genome. Neither the short reads nor the reference genomes were repeat-masked prior to alignment. A prevalent feature of mammalian genomes is the high content of repetitive sequences. Approximately 46% of the human genome, 37% of the mouse genome, and 40% of the rat genome are repetitive sequences [27, 28]. Repeat-masking either the short reads or reference genome would discard information about a significant fraction of the genome and would reduce coverage in an uneven manner . Recent work suggests that endogenous repetitive structures on CHO chromosomes may promote gene amplification and increase the stability of the amplified gene . Including repetitive regions in the assembly and analysis may help identify genomic structures associated with hyperproductive CHO cell lines. Several studies employed a similar approach to successfully generate genomic resources for non-model organisms from low-coverage data [25, 34, 35]. There are inherently some limitations to a reference-guided alignment and analysis regarding sequence similarity and genomic structure. MAQ allows up to 2 mismatches within the first 28 bp of each read and does not allow for gaps in the alignment . Short reads derived from regions with less than 94% identity to the reference sequence may not be aligned . This may account for the low percentage of total CHO reads aligned to either the mouse or rat genome and suggests that the CHO contigs presented here represent highly conserved regions between CHO cells and mouse or rat. In an initial genomic sequencing of the turkey using Illumina technology, only one-third of the short 35 bp reads could be directly aligned to the chicken genome, a closely related species, suggesting that a large portion of the short reads may not be expected to align in this type of analysis . Additionally, during alignment, the sequenced genome is scaffolded onto the reference, so the structure of the final consensus sequence may not be representative of the true genomic architecture . New methodologies are being developed to improve the consensus genomic sequences produced by reference-guided alignment [37, 38]. CHO cell lines commonly used in biopharmaceutical production have a reduced chromosome number compared to primary Chinese hamster cells . These cell lines also undergo genomic rearrangements as a result of amplification procedures used to develop high-producing cell lines [13, 14]. Therefore, the genomic structure of the Chinese hamster may not be representative of the individual cell lines and analysis of specific CHO cell lines may provide a better understanding of the structural changes associated with hyperproductivity. Of particular interest in CHO cell lines is examining the relationship between the location of the amplified gene and productivity of the cell line. BAC libraries were recently used to examine the site and structure of the transgene vector in gene-amplified cell lines [3, 4]. The DHFR amplicon is large, up to several hundreds of thousands of nucleotides, and may contain repeated segments of the endogenous CHO genome [3, 4, 39]. The small lengths of the CHO contigs makes it unlikely that any contig will span both the DHFR amplicon and the host genome. Additionally, the transgene vector sequence is not present in the reference genome used during alignment. This makes it difficult to determine the integration site of the DHFR transgene vector in this analysis. A greater coverage of the CHO genome to permit de novo assembly of the reads will facilitate determining the integration site and copy number of the DHFR amplicon in this cell line. Increased coverage and refinement of the CHO genome will also enable detection of other copy number variants, such as insertions and deletions, and accurate SNP identification to assist cell line engineering efforts [40–42]. The complexity of the CHO genome, including the structural rearrangements that occur during gene amplification and cell line derivation, makes assembly of a genomic sequence challenging. Next-generation sequencing technologies allow for the rapid acquisition of genomic sequence from CHO cell lines. This sequencing information can be used to generate a draft genome sequence when coupled with physical maps that can be derived from BAC libraries and a CHO scaffold that can be derived from cross-species comparative analysis. Incorporation of additional sequence data from transcriptomic studies and EST libraries will be necessary for complete annotation. The development of these resources is required to fully utilize sequence-specific tools, such as DNA microarrays and RNA interference, in cell line development and to understand how gene regulation and genome structure is altered in high-producing cell lines. CHO cells engineered to express human secreted alkaline phosphatase (SEAP) were generated from CHO-DUK cells (ATCC 9096) as described previously . CHO-SEAP cells were maintained as adherent cultures in IMDM (Iscove's modified Dulbecco's medium, Invitrogen, Carlsbad, CA) supplemented with 10% dFBS (dialyzed fetal bovine serum, Invitrogen) and 5120 nM methotrexate (Calbiochem, San Diego, CA). Genomic DNA from CHO-SEAP cells was isolated using the Genomic DNA mini kit (Invitrogen). A single-end library was prepared using the DNA sample kit (Illumina, San Diego, CA) according to manufacturer's instructions. The genomic library was sequenced on an Illumina GA system at the Cornell University Life Sciences Core Laboratory Center (Ithaca, NY) by running 36 cycles according to manufacturer's instructions. Approximately 2.72 Gb from 75,583,814 high quality reads passed the Illumina GA Pipeline filter and were used for alignment. FASTQ files containing raw sequences and sequence qualities were deposited at the National Center for Biotechnology Information Sequence Read Archive (NCBI SRA) under the accession SRA012218. While analysis of SRA data sets is computationally challenging, rapid improvements in assembly algorithms and computational power are enabling more researchers to benefit from this type of data set. Reference genomes for mouse chromosomes 1-19 and X (M_musculus Build 37) and rat chromosomes 1-20 and X (R_norvegicus Build 3.4) were obtained from the NCBI genomic download site . Reference guided alignment to both mouse and rat reference genomes and consensus sequence assembly was performed with MAQ 0.7.1  using default settings. MapView was used for visual inspection of alignments . Aligned reads were analyzed to determine if they mapped to unique or repetitive genomic regions, based on mapping qualities, or within protein-coding genes, based on genomic coordinates, using MATLAB (The MathWorks, Inc., Natick, MA). To verify sequencing reliability, the short read data set was aligned to the Chinese hamster mitochondrial genome (NC_007936.1) and resulted in significant homology. Known protein-coding gene sets for both mouse and rat were established as follows: genomic coordinates for mouse and rat genes were retrieved from Mouse Genome Informatics (MGI)  and the Rat Genome Database (RGD)  and filtered to retain only known protein-coding genes. The mouse protein-coding gene sets contains 21,691 genes from chromosomes 1-19 and X and the rat protein-coding gene set contains 26,450 genes from chromosomes 1-20 and X. Gene size is defined from the genomic coordinates from MGI and RGD and includes exons, introns, and untranslated regions. 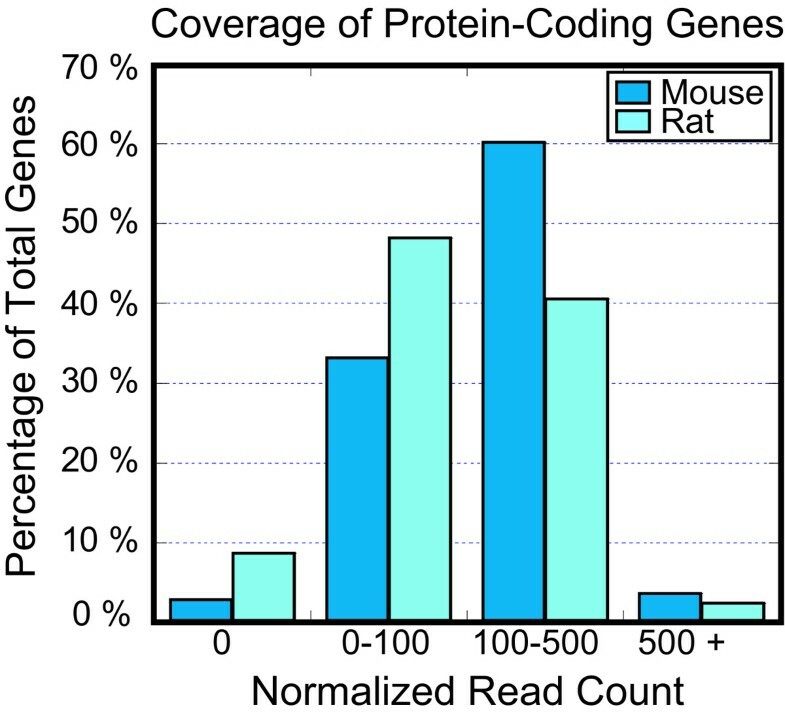 Normalized read counts were calculated for each gene in the protein-coding gene sets to which short reads were mapped. A normalization factor was calculated by dividing the size of each gene by the average gene size in the protein-coding gene sets, with an average gene size of 44,862 bp for mouse and 34,186 bp for rat. Normalized read counts were determined by dividing the raw number of reads aligned to each gene by the normalization factor calculated for that gene. Gene names and Gene Ontology (GO) terms were assigned to all contigs that shared sequence similarity with known protein-coding mouse and rat genes. Contigs were extracted from consensus sequences using Python and custom scripts. Contigs were aligned to reference genomes using BLAT  and viewed using the UCSC Genome Browser . Sequence comparisons were done using standalone BLAST from NCBI . Custom genomic databases were generated from mouse and rat reference chromosomes. Contigs were mapped to these genomic databases using BLASTN with a significance threshold of e < 1-10. BLAST outputs were parsed using Perl scripts to retrieve the best hit for each contig. Gene names and GO terms were retrieved for each contig that hit a known protein-coding gene. GO IDs for mouse (NCBIM37) and rat (RGSC3.4) genes were retrieved from ENSEMBL (release 56) using BioMart . GO analysis was performed using the CateGOrizer web tool . This work was supported by Cornell University and the University of Delaware. The authors thank Peter Schweitzer at the Cornell Biotechnology Resource Center for Illumina sequencing and Manoj Pillay for assistance in processing consensus sequences. SH performed data analysis and drafted the manuscript, JCS prepared samples and participated in data analysis, MK performed data analysis, KHL conceived the project. All authors have read and approved the final manuscript. The corresponding author will gladly provide detailed information on the cluster hardware setup, analysis software version and parameters, upon request.